In simple terms, Situational Awareness is the process of knowing what is going on around you at all times and having a tentative plan to respond to an abnormal occurrence. Many people consider individuals who practice situational awareness as overly concerned, paranoid, insecure or just scared, none of which are true. Being cognitive of your surroundings and having a tentative plan to respond to abnormal situations is the key to survival and gives you a tremendous advantage when things go bad. Situational awareness was first explored when researchers studied the successes of American pilots in Korea and Vietnam. When the best dog-fighting pilots were asked what they believed contributed to their success, they all had the same answer. Based on their past experiences and observations, they were able to anticipate the next move of the pilot they were chasing. Thus, they maneuvered into a position of advantage by correctly anticipating the enemy pilot’s next move, which resulted in them winning the dogfight. That research led to the development of a complex but concise logical pathway of decision-making that leads to success. John Boyd developed the Observation, Orient, Decide, Act loop (OODA loop). It diagrams an organized process by which successful decisions are formulated. It appears very complex; however, once broken down, it is a very simple means of preparing yourself for the possibility of an event. The original decision making information is obtained during the “Observational” phase. Based on the information acquired, it is applied to “Orienting” one’s self to anticipate the next event. With this information, you begin to “Decide” your “Action”. Once you are properly informed, positioned correctly, and have a tentative plan, you have the advantage when it is necessary to act. Even though you may not have time to study the Boyd Loop, you can apply the concepts as part of your situational awareness procedure. The practice of applying this process to all aspects of your life can improve your performance in everything from driving, work, and hobbies to family and relationships. 2) Whether you are alone or with others. These are important considerations when planning your actions. For example, are you alone, with friends or with your family? In each of these cases, your response to an abnormal situation will be entirely different. Obviously, if you are solo, your actions do not need to be coordinated with anyone else. This will give more options and fewer restrictions when determining your action. On the other hand, you may be with your family, including children. Clearly, your response to an abnormal situation will be considerably different. In this incidence, you need to predetermine your actions and you may need to inform others in your group of possible actions. Considerations in this environment include how fast they can move, how they will need to be protected, and whether or not they understand directions. This is a far more complex set of action plans, so your situational awareness and prepping need to be implemented earlier rather than later. For example, if you enter a restaurant with your wife and children, you should choose your seating so you can see the door and see the largest area of the facility. Secondly, you should choose to be as close as possible to an exit in case you need to carry your children out. Finally, you and your wife should be sitting on the outside of the booth or table in case you need to maneuver quickly. In light of all the above, situational awareness is a state of mind. Thus, it must be practiced constantly to become fluent in its use and application. In addition, understanding the various states of mind is imperative to understanding situational awareness and applying it daily. 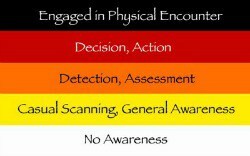 Jeff Cooper adapted a military concept of combat mindset into a color-coded definition of human awareness and response to critical situations. It is vital to understand these conditions. White: Completely unaware of your environment and surroundings. This is clearly the most dangerous condition to be in because you are the most vulnerable. This condition occurs while you are driving, day dreaming, talking on your cell phone, texting, and managing your children. Naturally, there are many many more instances that could be mentioned, but these are a few to reflect condition White. Again, this is the most dangerous condition to be in – the condition that bad guys like to find you in so they have the advantage. Yellow: Relaxed but alert and acknowledging your surroundings. This is the first stage in the OODA loop. This is your observational phase. You are looking around, noting where there are exits, watching who is entering the door, getting the lay of the land and considering action plans. This can be conducted in a casual manner without anyone knowing you are observing your surroundings. This level of awareness will allow you to notice normal and aberrant events quickly. This is the phase when you will begin to notice things you have never noticed before. This is a good thing. Orange: Alertness has increased significantly, something is not right, action maybe required, and more formal action planning is required. Examples include people arguing, someone acting inappropriately, someone moving into your personal space, or an actual bad event taking place. This is an action level of awareness. You need to make decisions at this level. You could decide to leave the area and be non- confrontational. You might decide to gather your children. Seriously, consider you personal protection action. If you have practiced level Yellow well then this phase can be managed easily. However, if you have not implemented condition Yellow, you will be caught off guard, confused and disoriented when an untoward event occurs. Red: Immediate Action is Required. This does not necessarily mean “intervention” action. It could mean leaving the scene, finding the fastest exit. On the other hand, intervention such as actively protecting yourself and family members with the use of some form of personal protection device could be necessary. Red is implementation. This is the time when fear, reservation, confusion and lack of planning can place you in greater danger. It is imperative that you be assertive at this level. If you have managed level Orange well, then this phase can be seamless since you know what you are going to do. The final condition is controversial. It is Black. In this condition, you may be in a state of shock or confusion. What just happened? This is the level where you must regain your conscious state of mind, organize your thoughts and focus on the situation. What can help you be better prepared should an untoward event occur? The best way is to have your Every Day Carry (EDC) tools with you and readily available. Your EDC tools should include keys, cell phone, flashlight, knife, multi-tool and personal protection device. This small compilation of tools gives you tremendous ability to manage multiple possible scenarios that might occur. Naturally, having your keys close by enables you to get into your car and drive away if you can. A flashlight enables you always to have light should the electricity go out, or to exit a location at night. A knife can be used in many cases, from personal protection to cutting material. The multi-tool is useful if you are separated from your transportation and you need a tool for any job. Finally, you will need your personal protection device, whether it be a firearm, pepper spray, or a taser of some type. We have discussed the basis of preemptive decision making, the psychological states of mind in which you may find yourself and, finally, items that you may need in an untoward situation. The next two steps in this process are of the utmost importance: Training and Practice. I, along with all other professionals in the firearms, personal protection and safety business, cannot stress enough how important training is when it comes to operational success. Thus, to perfect your skills you must train constantly. That means you need practice making methodical decisions based on good information. Practice situational awareness all the time, no matter where you are. Finally, learn how to use your EDC tools effectively and quickly. Practicing these skills is the key to success and positive outcome. It is imperative that you do this. Here are some examples. Let us start with decision-making. Try to train yourself to not make any decision while you are angry or emotional. Learn to slow yourself down, look at the facts and then make a solid decision. Another practice scenario is more complex and engaging. When at an event, observe what is going on around you and try to anticipate the actions of the people you are observing. An example: a man and woman walk into a restaurant and, as they sit down, the man pulls the chair out for the woman. My guess would be that when they leave he would pull the chair out for her as well. This is great observational practice. Next, learn to plan as you observe. As you enter the restaurant, take a minute and determine the following: Where are the exits?…. Where can I sit so I can observe the door?…. Where is the least crowed area of the restaurant so that I can have space?…. Can I see my car from the restaurant?…. As you walk to your seat, observe the people eating and what they are wearing… Finally, make a quick plan: If this happens, I am going out that door… or if that should happen, I am moving to that location. Then enjoy yourself and keep a watchful eye on your surroundings. The next step in this series is to learn how to use your tools very well. Make sure your phone has a quick button for calling 911. Practice opening and closing your knife, to the point that you can do it in the dark safely. Finally, and most importantly, make sure you know how to use your personal protection tool very very well. I cannot express how important this is. This tool may save your life. You need to know how to use it without reservation when the need arises. Hesitation in using your personal protection device can mean the difference in being a victim or a survivor. In summary, Situational Awareness is a mental state of alertness that enables you to be actively aware of your surroundings in the event an untoward incident should happen. In that case, the proper application of Situational Awareness will enable you to respond quickly and intelligently so you can properly address the aberrant event. Having the necessary EDC survival tools with you and the comfort and knowledge of their use will enable you to feel secure in your actions. The ability to respond quickly and affirmatively and the sense of security come only from practice, practice and practice. Also read Captain Bart’s take on Situational Awareness (Click Here).